Over 600 years of Welsh military tradition has come to an end on St David's Day with the merger of two famous Welsh regiments. 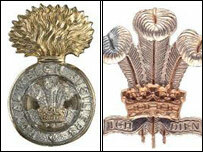 The names Royal Welch Fusiliers and The Royal Regiment of Wales were consigned to history with the birth of the new regiment, The Royal Welsh. A cross-party group of Welsh MPs had fought a rear-guard action for the names of the old regiments to be kept. An inaugural parade, with mascot goats, was staged in Cardiff on Wednesday. Led by the regimental goat mascot seven battalions of the new regiment stopped traffic as they paraded up St Mary's Street to City Hall where Cardiff's Lord Mayor Freda Salway took the salute. 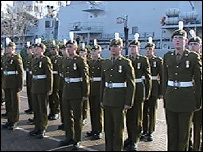 The regiment's colonel Brigadier Roddy Porter said its formation - on St David's Day 2006 - was a "unique and significant occasion for the army in Wales". "We want to dedicate ourselves publicly to following in the footsteps of our predecessors' faithful and professional service and thank them for the heritage they gave us." The band of the Royal Welsh also played as guests arrived at the state opening of the Senedd in Cardiff Bay and it formed two of three guards of honour as the Queen and other dignitaries arrived. The UK Government announced the regimental mergers in 2004 as part of a shake-up aimed at improving the flexibility of the British Army's response to its 21st-century challenges. Perhaps the best known battle by any of the regiments is the stand by 145 soldiers of the Royal Regiment of Wales at Rorke's Drift, South Africa, in 1879. The soldiers of the 24th Foot, which later became the South Wales Borderers, held off an army of about 4,000 Zulu warriors at a border post in an action which was immortalised in the 1964 film Zulu, starring Michael Caine. Critics claimed the regiments' Scottish counterparts have had a better deal in the army reorganisation. In Wales, two battalions of the new regiment will be known as 1st Battalion The Royal Welsh (The Royal Welch Fusiliers) and 2nd Battalion The Royal Welsh (The Royal Regiment of Wales). The battalions forming the new Royal Regiment of Scotland are to keep their traditional names and put the new amalgamated name in brackets. However, Brigadier Iain Cholerton, Army Commander Wales, a former commanding officer of the Royal Regiment of Wales, has said the merger was "not bad news for Wales or its regiments". "The Welsh Guards are not affected," he said. "There will be considerable strength through unity for the new regiment for issues such as recruiting, career opportunities and operational deployments. "Wales can be proud of its regiments and their histories and traditions that will be continued in the new army structure." The regiment officially came into being at the start of St David's Day but about 900 regular and Territorial Army soldiers and army cadets will parade at a Drumhead Service in Cardiff's St David's Hall to inaugurate it. The Royal Welsh marked its formation in north Wales with a parade in its Hightown Barracks in Wrexham. The event was followed by St David's Day celebrations including traditional leek eating at the barracks.